Pomegranates are a wonderful food when consumed in moderation. They are not only naturally bright red, but are loaded with a powerful antioxidant called punicalagins which are found in the juice and peel of a pomegranate. They are so powerful that pomegranate juice has been found to have three times the antioxidant activity of red wine and green tea (1). 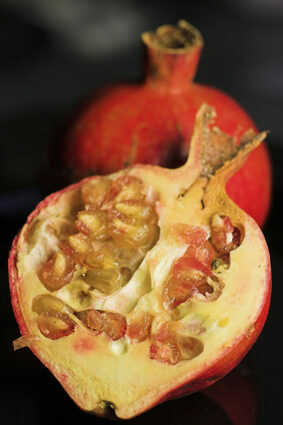 The seeds of the pomegranate are called arils. one cup of arils contains: 24 grams of sugar, and 144 calories (1). Pomegranate has a hidden benefit. They also help lower blood sugar. Consume only pure undiluted pomegranate though for this health benefit. Mix 1-2 oz pomegranate juice twice daily with 6-8 oz water. Add stevia for natural sweetness without the sugar. Test your fasting blood sugar before and after you drink this concoction for 2-3 months and see if you notice a difference. © 2016-19 Clair Pavane Nutrition Research. Voetelle Art & Design.